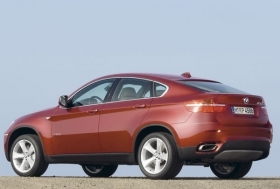 Strong demand in Europe for the X6 has helped BMW's U.S. plant. BIRMINGHAM, Alabama, USA -- Strong vehicle exports and manufacturing flexibility have allowed BMW's U.S. plant to weather the economic downturn without layoffs or derailing a $750 million expansion, the factory's chief says. Speaking here this week at the Automotive News Manufacturing Conference, Josef Kerscher said BMW exported more than 60 percent of the 171,000 vehicles produced last year at Spartanburg, S.C. That record output of X5 and X6 premium SUVs required extra shifts of mostly temporary workers last year, said Kerscher, president of BMW Manufacturing Co. in Spartanburg. Most of the temporaries have been let go. BMW division's U.S. sales slumped 30.5 percent in the first five months, less than the industry's 36.5 percent decline. Still, BMW Manufacturing has not laid off any of its 5,000 full-time employees, and the plant continues to run two shifts, Kerscher said. Manufacturing flexibility allows BMW to exactly match its production to customer demands, Kerscher said. BMW customers can make changes to their vehicle orders or add options in as little as five days before a vehicle is built, he said. That level of flexibility is the best in the auto industry, he said. That flexibility is critical to keeping the Spartanburg plant humming, Kerscher said. He said that at one period last year, the plant was making about 50 percent of its vehicles for the United States. Almost overnight, production was shifted to more than 70 percent for export. Strong first-quarter sales of the X6 in Europe are helping to partially offset the X5's 37.6 percent drop volume to 8,883 units. The plant's manufacturing processes have been calibrated to accommodate the hundreds of option combinations necessary to meet those differing tastes, Kerscher said. European vehicles, for example, require more diesel engines than U.S. customers buy. Spartanburg is the sole producer of the X5 and X6 for sale in more than 100 countries. This autumn, BMW will add another level of manufacturing complexity at the plant when it begins production of the 2010 X5 M and X6 M. Those are 555-hp performance versions of the SUVs. An expansion to take capacity to 200,000 vehicles per year from 170,000 is well under way, Kerscher said. He wouldn't say when the expansion is expected to be completed. BMW plans to bring worldwide production of its X3 premium SUV to the plant from Graz, Austria, where it is now built under contract by Magna Styr. Kerscher said a new-design paint shop planned for the expansion will eliminate the necessity for primer. That change will allow BMW to save about 20 percent on the cost of painting its vehicles.